This the reason why we had to take a trip back to the Philippine store today. The store owner promised the little one a fan similar to the one displayed on the wall of her store. 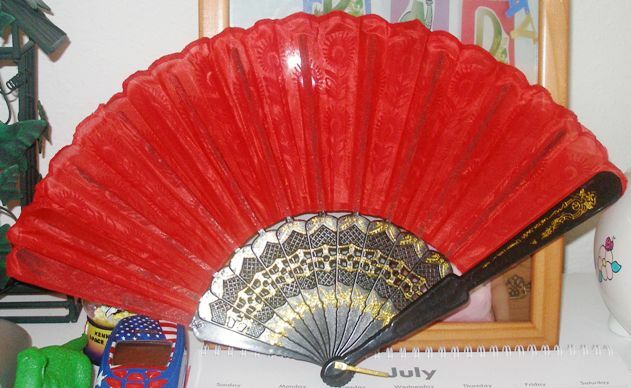 The fan on her store wall is actually a souvenir fan from the Philippines but she said that she could get fans similar to it in the 'tiangge' she goes to every weekend. Unfortunately, it was raining when she went so the 'bangketa' [sidewalk] didn't have any vendors so she wasn't able to find the fans. But since she promised the little one a fan, she just gave her this one which she got somewhere else some time ago. She said she knew the little one will be coming back this weekend and she didn't want to disappoint her. Such a sweet lady. Anyway, the little one is happily playing with it right. She said she can now'open' it easily....haha. The joys of simple things, eh? bigla akong nag reminisce seeing the pic. mahilig din ako nyan when I was E's age. yan at handkerchief.I was not able to function pag wala ako nung dalawa hahaha. mainit pa din kami dito. we're not seeing any relief in the coming days this week, if I believe the forecast. I'm not inclined to complain though kasi I'll take this weather over freezing temps. sana'y maganda and unang araw ng iyong linggo. take care! The fan might be simple pero maganda. Kaya siguro fascinated si E apart from the attractive color. Girlash na tunay eh! Typhoon Basyang just left the country but she destroyed a lot of infrastructures and numbers of death toll. At least. di sya tulad ni Ondoy. Have a great Thursday Huling!